A splendid 1890 era bedroom set was hand carved in France in the Louis XVI manner, and includes a queen size bed and two marble top nightstands. Solid oak and chestnut, the renewed finish is in excellent condition. The traditional crest with a quiver of arrows and a torch is masterfully carved in high relief. There are shrinkage separations from age, see photos. Marble tops on the nightstands have been polished and sealed to resist stains. Drawers have hand cut dovetail joints. Size is 18" wide, 16" deep, 38" tall and the marble tops are 32" high. The bed has been expertly adapted to fit a standard modern queen size mattress as shown. The demonstrator mattress and spring unit are 18" thick together. Wood supports are included. 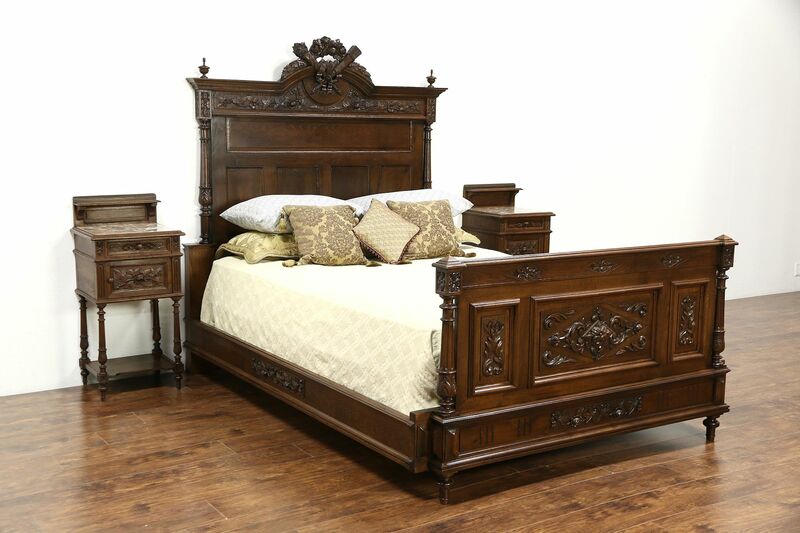 Measurements are 90" long, 66" wide, the headboard is 6' tall and the footboard is 3' high.